Happy New Year!! I hope you had an amazing and relaxing Winter Break! I'm guessing for most of us it's back to the grind. And, unfortunately, I think many of us know that after Christmas that might mean starting to think about the dreaded test prep. I know, I know, we don't want to talk about it. And we hate that we even have to do it, but it seems to be a necessary evil. So, why not try to make it as interesting as possible? When I was teaching 3rd grade my state had just started a "new" test. There was hardly anything out there last year for me to help my students get ready for the format of this test. That led me to create all of my informational article packs. 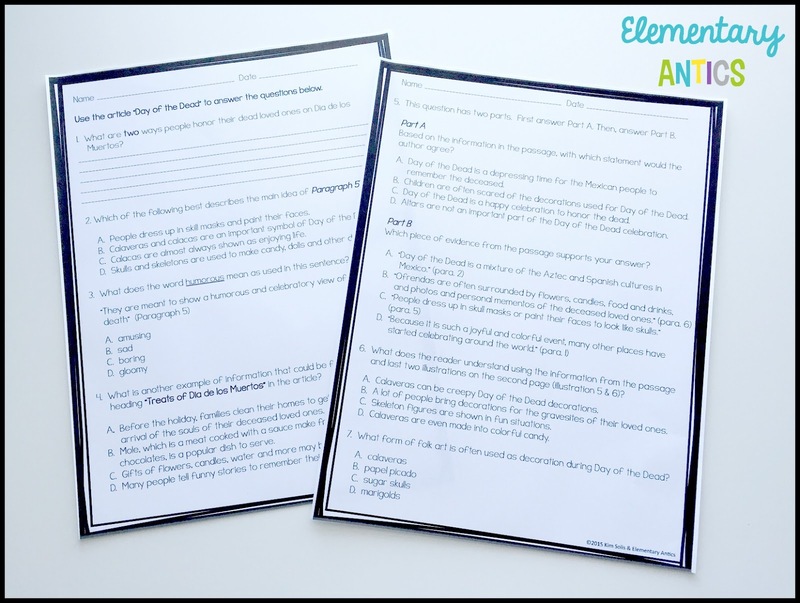 These are original non-fiction articles on interesting topics with questions written using the Florida Standards Assessment specifications. 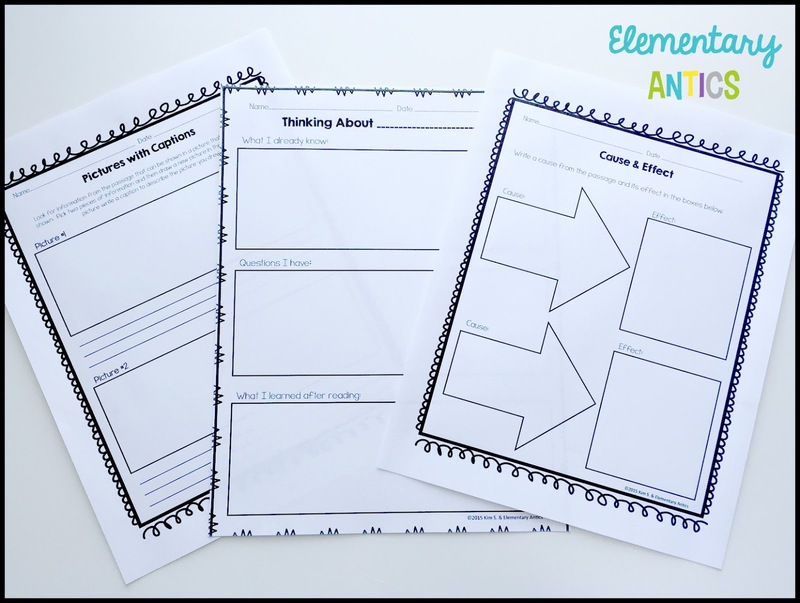 Graphic organizers that you can use for just about any non-fiction text are also included, along with two language/editing mini assessments. 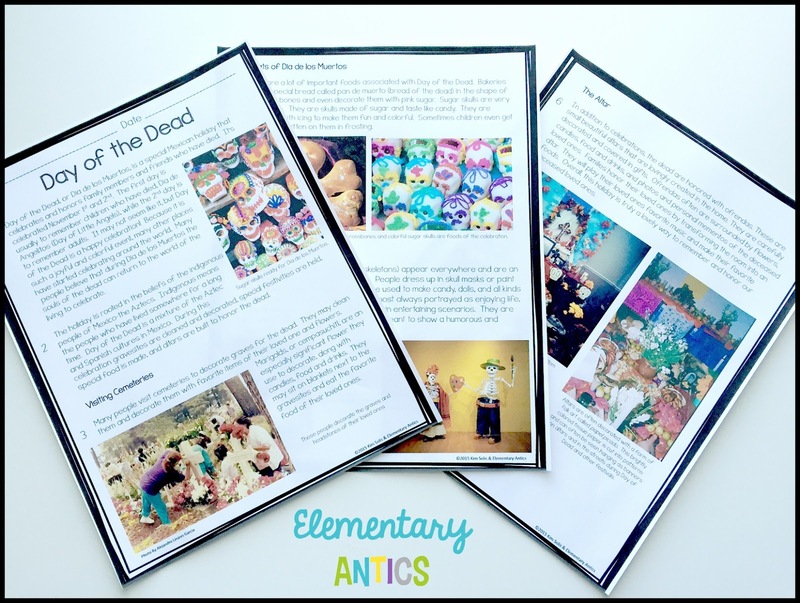 So far I've created one on polar bears, snowy owls, Egyptian mummies, Florida manatees and my newest article is on Day of the Dead. Back when I was going through getting my National Board Certification I did a social studies unit with my class on Mexico. I loved doing this! I was able to incorporate almost every subject in our study of the country and we focused a lot on the holidays and the arts of Mexico. We learned a lot about Day of the Dead and I thought it was such an interesting celebration. That was my inspiration for this newest article! I've used these articles as cold read assessments, test preparation, close reading and even guided reading. This article has 8 comprehension questions that students can complete after reading. Along with the article and questions, I also include 1 or 2 nonfiction graphic organizers in each pack. 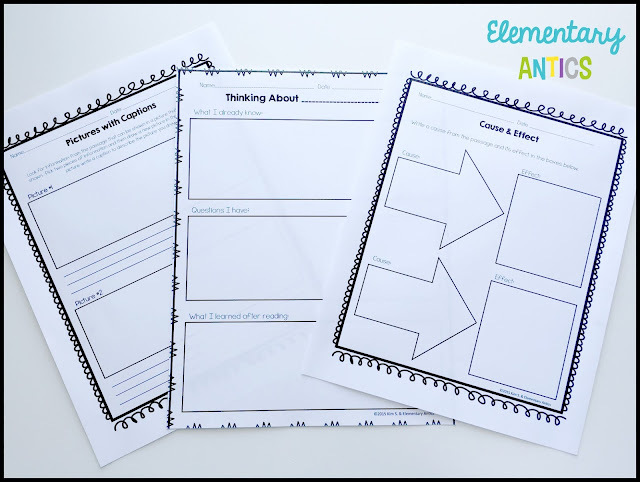 All of graphic organizers are different in each pack, so you can have quite a variety. 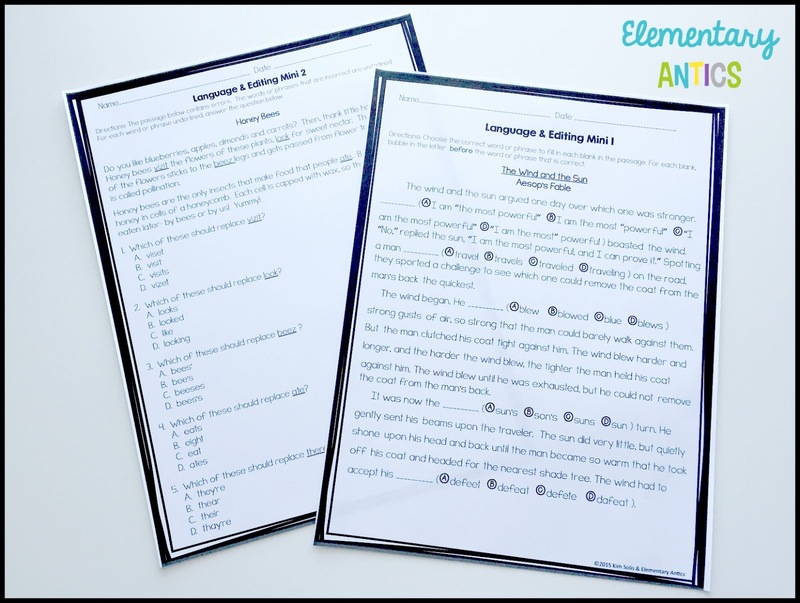 These can be used with pretty much any nonfiction text. Lastly, there are two language editing practices included. 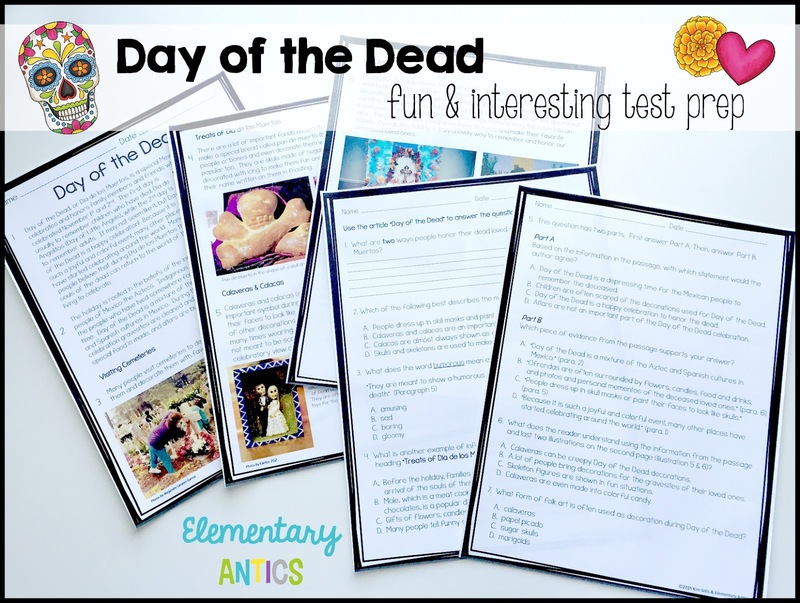 There are two different question formats in this Day of the Dead article pack. If you feel like doing something fun after the hard work you have to check out these Day of the Dead sugar skull coloring sheets. They are so pretty and fun to color! I just used my Flair pens to start coloring mine. :) Also, follow my Day of the Dead Pinterest board for more fun ideas and activities. Follow Kim's board Day of the Dead on Pinterest. Also, don't forget to subscribe to my monthly newsletter! You get an exclusive freebie just for signing up!